On my continuous quest to hack my own body I came across the Whole30 and decided to give it a try. That doesn’t really describe my current situation, but hey… Can’t really hurt (hopefully). See: I started on that path in 2010 when I was diagnosed with Diabetes type 2 and weighted 146Kg (321 lbs). That was a call for a change and I embraced a low-carb diet, more specifically the Atkins diet. You won’t be using sugar, honey, maple syrup, splenda, equal or any kind of natural or artificial sweetener or sugar substitute. No grains. None. NO, not even whole, multi-grain, heart-healthy (which is an oxymoron, by the way). Meaning no beans, peas or peanuts (which are not really nuts. They are legumes). Say farewell to Milk, cheese, butter… you got the idea. Soy, sunflower, corn… gone. None of those oils. Natural, that is. No, chocolate is made of cocoa, but it’s not a fruit. Almonds, pistachios, brazilian nuts, cashews… endless options. No calorie count, portion size control or checking your weight during the 30 days. Well, I looked at it and thought: Damn! I’ll really miss dairy. Everything else seems to be a walk in the park. If nothing else I’ll have more stuff to eat, since I usually don’t have fruits. Everything and anything I would eat had to be bought on raw state. Exceptions: Olive Oil and Coconut Oil, which I figured I couldn’t make myself. That makes things more challenging, as I just threw away bacon, canned vegetables, salsa, canned tuna and many others. Even my dear roasted/salted almonds would be off-limits, having to resort to the raw ones. Also, everything that I ate had to be prepared by myself or by my wife, under my directions. Here one thing scared me a little: No more protein shake. First reason because it’s whey protein, which is dairy, so it’s out. Second reason it’s pre-processed food, so it’s out again. Considering how much I work out I was afraid not having my post-workout shake could be detrimental. My BCAA supplements were out too. At least once a week I would be adding a full day fasting. I picked my days off on my workout schedule for those. Please, note that I’m not new to fasting and I do it fairly often. I also walk around 2K during my lunch breaks. After my major weight loss and engaging on sports — but stalling at my body composition — I decided to ditch the scale as my primary metric and chose to use athletic results as a better benchmark. It’s even easier as a crossfitter since I can look at my lifts and benchmark WODs, compare to past months and tell right away what happened. In summary I added 3 personal records to my lifts and 1 benchmark WOD during the whole30. Yeah, look at the muscle mass. Disappointed. I’ll definitely do the Whole30 again. Maybe twice a year or so, but just as a will power exercise, since I don’t have a dysfunctional relationship with food for a long time now. It wasn’t a big change on my already low-carb Atkins diet. Craved cheese. And Mayonnaise. And Tabasco sauce. My own “nazi” version kept me away from bacon. That was sad. To keep track and engaged I put a whiteboard in the kitchen counting the days into the diet. Updating the number everyday gives a sense of accomplishment. 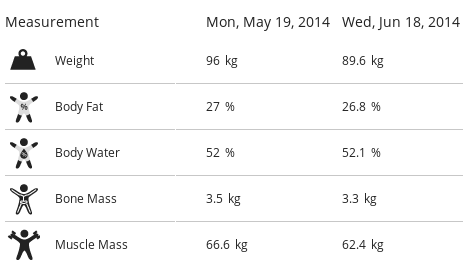 For my activity level I figured the Whole30 is not ideal, considering how much lean mass I lost. I would need to up my protein intake a lot, but eating that much protein is pretty hard, so liquid form protein — shakes and whole milk — are the way to go. From now on I think I’ll stick to raw nuts. I kinda like them now. Have you ever tried the Whole30? Can I hear your thoughts?